By: Emery Roth II. In this ode to Connecticut’s Naugatuck River Valley, vibrant photos and moving poetry relate the region’s legendary industrial history and ponder its legacy. The story begins in 1802, when two metalworking families joined forces to manufacture brass. Business soared during the War of 1812 with the demand for buttons, and soon brass parts became essential in the age of steam and electricity. As large-scale brass manufacturing grew across what became known as the Brass Valley, mill towns along the river – such as Torrington, Waterbury, and Ansonia – developed into thriving cultural centers. This continued until 2014, when the last plant closed, and the tradition of soot-covered workers charging generations-old furnaces came to an end. 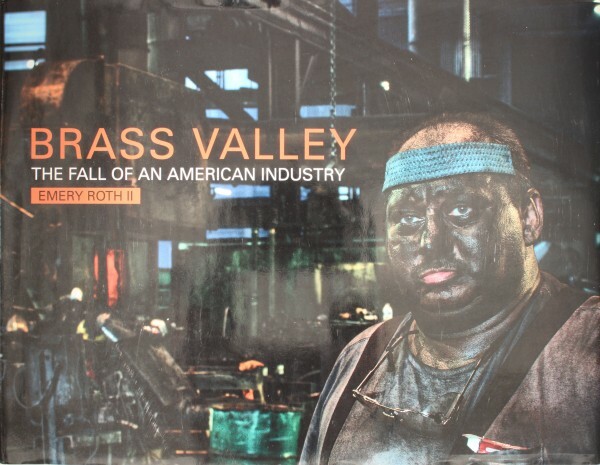 This poignant elegy captures the glowing metal flying through the air at the Ansonia foundry in its final days, as well as abandoned opera houses and train tracks, the vestiges of a dying infrastruture and American way of life. Published by: Schiffer Publishing, Ltd. 2015.